England players have been banned by the Football Association from having nights out while on international duty. The FA is looking into claims several players were out until late on Saturday night after Friday's 3-0 win over Scotland - less than three days before they drew 2-2 with Spain in a friendly. Wayne Rooney apologised after pictures showed him at a wedding that night. Meanwhile, the Sun claims up to 10 other players were at a nightclub drinking until 04:30 GMT on Sunday. 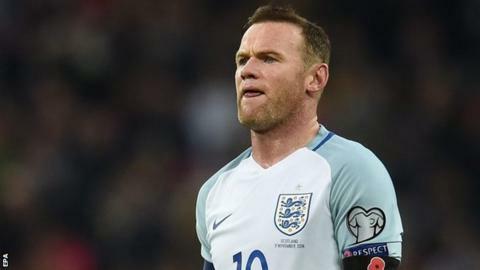 A statement issued on behalf of England captain Rooney, who had attended a wedding at the team's hotel, said: "Naturally Wayne is sorry that pictures taken with fans have been published. "Although it was a day off for the whole squad and staff, he fully recognises that the images are inappropriate for someone in his position." The FA, whose decision is not prompted purely by Rooney's night out, is not expecting to discipline anyone. Chief executive Martin Glenn said: "Don't make a drama out of it. We are having a proper investigation into what went on. It's disappointing. It's appropriate that he apologised. It doesn't set a great tone for the England captain but I don't want to over-dramatise it either. "Were there FA staff involved? We're establishing the facts. We're talking to people who were there to find out if anybody from the backroom staff was involved. Why on earth would you be doing that given there is a team agreement around alcohol consumption during camp? There would be questions asked for sure. "There's been a journey. A strict disciplinarian like Fabio Capello where the players were closeted away, it was seen not to be a good success. Roy Hodgson brought a more liberal approach. Roy was right, let's treat people like adults. "The best agreements are when players come up with their own rules and then work with them. I think we're probably in the right ball park. We just need to have a degree of trust and make sure when we agree something as a group, we stick to it." Glenn added he had no intention of speaking to Rooney's Manchester United manager Jose Mourinho, who was said to be unhappy with the situation. England's players, who will still have free time but not whole nights off, all reported back at 11:00 GMT on Sunday as they were instructed to, and attended training in the afternoon. When asked about the Rooney story, Liverpool manager Jurgen Klopp said he did not see a problem. "I feel sorry for the players," he said. "We live on the sunny side of life, but in the end maybe it is a surprise there is a human being behind the kid. "This generation is the most professional generation of footballers we have ever had - not only in England. All the legends you admire, they drank like devils and smoked like crazy and were still good players. Nobody does that any more. "I've no idea where Wayne was but I'm pretty sure it was not that serious." Scotland and West Brom captain Darren Fletcher defended his former Manchester United team-mate in an interview with BBC Radio 5 live. "The whole situation is very unfortunate," said the midfielder, 32. "I hear a lot about how professional footballers are detached from the public and they don't mingle any more. This circumstance shows why professionals are scared to do it. He's suffered the consequences of the social media world we live in. Players will be even more guarded now. "People plaster you all over social media when you're kind enough to take pictures with fans. "He holds his hands up. It's been blown out of proportion. That's not me defending my friend, Wayne Rooney, that's me defending most footballers who like to let their hair down. He's made a mistake but a genuine one in terms of trying to give a bit of time to fans when he was a bit worse for wear. "He's the most down to earth guy you'll ever meet. If he gets the chance to socialise with normal people and his guard is down, he's probably let the guard down too far. He's almost been too approachable and down to earth." England's rugby union coach Eddie Jones appeared to criticise the football set-up when asked about the situation. "The time we have a curfew is the time we don't have a leadership group in the team," he said. "They are adults. The guys will come back, have a beer and decide when they go to bed." Rooney's rugby counterpart, England captain Dylan Hartley, agreed with his boss. "The guys are all adults," said Hartley. "We come back here as a team afterwards, we have recovery on a Sunday and a big Test match to prepare for. "As soon as we start making rules we have an issue. It is about individual responsibility. I'm not sure about other teams but that's what we do here."